Head out in to the cool, green native bush of New Zealand’s Bay of Plenty wonderland. A myriad of beautiful walks suitable for varying fitness levels lead to stunning waterfalls, circle incredible lakes or take you to some of the tallest trees in the world. The Kaimai-Mamaku Forest Park, on Western Bay of Plenty’s doorstep, offers walks to the remnants of Kauri dams, waterfalls, old pack tracks and a disused gold mine. Rotorua has the incredible Redwood Forest, dotted with many tracks and the region’s amazing Lake District, Tarawera Forest and rugged Urewera National Park nearby. Katikati offers an interesting twist on the traditional bush walk, with its Haiku Pathway. The Haiku Pathway is a restful, contemplative walk in peaceful surroundings and includes a beautiful river boulder trail where the stone has been carved with Haiku verse, carefully selected by a local poet. Start at Katikati Bus Company on the Main Street and follow the path down to the river. Either cross the bridge and follow the river to State Highway 2 and join the Uretara Walkway, or remain on the town side of the river and zigzag back up towards the library. Waikareao Estuary Walk: An easy walking track with a two hour return loop and many shorter sections. Tracks around the estuary view native bush and grassed areas and boardwalks through the mangrove tidal zone make it easier for walkers to see flora and fauna. There are plenty of grassy areas for picnic spots. Cycling is permitted, but not motorbikes. Yatton Park Walk: An easy walk, just one hour return. Enter from the Fraser Street entrance and follow the Waimapu Estuary to Yatton Park. The park contains some of Tauranga oldest trees, 16 are the largest of their species in the North Island. The park offers picnic areas, a playground and public toilets. Cycling is not permitted. 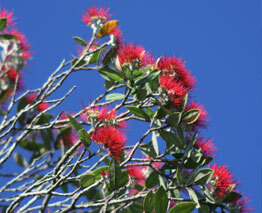 Mt Maunganui features one of the areas best known walks, around the circular track of the mountain itself. Mauao provides a safe circular 45 minute track for keen runners and walkers or those taking in the fantastic scenery. Begin at Pilot Bay (the harbour side of the Mount) or take the entry way from the main ocean beach. There are many restful seating areas to watch ships and boats cruise by, or enjoy the shade of the New Zealand ‘Christmas Tree”, the Pohutukawa. For the more adventurous and physically fit, there is a walking track taking you to the summit of the Mount. After a good, strong uphill walk through native bush, the stunning views over the coast and township are your reward. Click here to read more about Mount Maunganui.